I like Philippians 4. I think plenty of people do. The book of Philippians, though short, was likely written when the apostle Paul was imprisoned to encourage and comfort the Church of Philippi in this harsh time. Philippians 4 consists a number of short verses that, though short in length, are deep in significance. Easy to memorize, easy to remember, easy to keep in mind, easy to recite when in times of need. Like many of other verses in Philippians 4, I’m sure Philippians 4:13 is a favourite verse of many, and very commonly quoted amongst Christians ever since Paul wrote it. This verse is so short and so well-known that it seems unnecessary to analyse it anymore. At times when it seems like we can no longer exert ourselves, we can find our strength in the Lord. While Paul said ‘I can do everything’ – it certainly doesn’t refer to sin – for the strength that we receive from God is not meant to aid us in the sinful acts of men. Paul probably didn’t mean ‘everything’ as everything good, like wealth and riches – which are not sins – but he most likely referred to seeking contentment in suffering. Being content in your suffering is not an easy feat – it requires strength from God. A superhuman strength. Being content in your suffering requires hope for the future as well. That too, comes from God. While God gives strength, it is on our onus to seek God for strength. If one party wants to give, but the other party refuses to receive, it is meaningless. If someone left a parcel on your doorstep, but you refuse to open the door, you will never get the parcel. Because God is a giver, we often forget that we have to turn to him in order to receive. We need to turn to God for strength, because man alone is weak, and many men together is, in my humble opinion more often than not, only weaker and not stronger. God said, My grace is sufficient for you, for my power is made perfect in weakness [2 Cor 12:9|Article]. We are weak. That’s something that we need to accept. Yet there is nothing to fear, because God’s power is made perfect in our weaknesses. We just need to turn to him. I can do everything through him who gives me strength. While it doesn’t mean to insult us that we cannot do nothing if not for him who gives us strength, the converse way of thinking about this verse is likely true. ‘Nothing’ here does not mean that we cannot do any work; just like how ‘everything’ here does not mean every single act or intention – but this teaches us to be grateful to God. We need God’s strength. It’s just as simple as that. It’s not a luxury item. It’s majestic yes, glorious yes – but it’s not luxurious. It’s like air – we need it. We cannot do without it. Without God’s strength, we cannot do much. Without God, even if we get something done, it is meaningless. The irony of this verse is that it’s often used to encourage people to seek greater heights and challenge for greater achievements. From Philippians 4:10-12, Paul speaks about the importance of contentment in the Lord. The idea that he can do everything through God who gives him strength is born out of his ability to be content in the Lord. I’m not saying contented people shouldn’t seek greater heights or challenge for greater achievements. It’s good to improve, it’s good to better. Just that when you fall from those heights, or fail those challenges, this verse is equally important to fall back on. 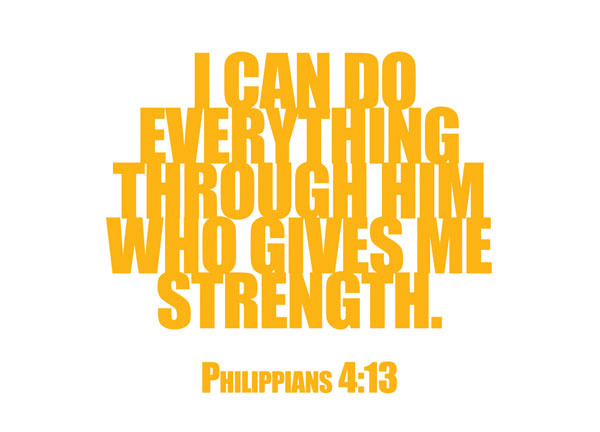 I can do everything in God who gives me strength. The crucial word of this verse is not ‘do’, it’s not ‘everything’, and it’s not ‘strength’. It’s ‘in God’. Reblogged this on Mustard Seed Budget. Beautiful insight. Thanks for a great blog entry! I love this! I recently made a page available on my business leadership blog Linked 2 Leadership and created a short link that is Philippians 4: 6-9. I send the link to hurting or distressed people I find on Facebook, Twitter, LinkedIn or email. I use “The Message” translation because it is so plain and easy for believers and others. The link also provides a hint of hope and gets clicked. I usually receive a heartfelt thanks. See http://tinyurl.com/YourHelpOnTheWay and send it out when you sense someone needs the peace that only Christ can provide. This is my all favorite verse, thanks for posting it! This one I turn to a lot.. great post love it! Good exposition. True to the sacred text. Thank you, young lady.